Doc McStuffins dolls were a big hit last year, so it's no surprise that toy-fixing Dotty is back for Christmas 2013 with new playsets and figures. Dottie 'Doc' McStuffins, a six year old girl, 'fixes' toys, with a little help from her stuffed animal friends, Stuffy, Hallie, Lambie and Chilly. Your stuffed animals and toys have never been more excited to get their check ups! 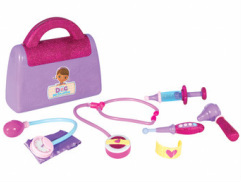 Doc McStuffins Doctor's Bag Playset includes 8 glittery and sparkly pieces - Doc's bag, play thermometer, syringe, blood pressure cuff with working gauge, otoscope, bandage cuff, sticker sheet, and Doc's magical light up stethoscope! Made by Just Play, the Doc McStuffins Deluxe Get Better Check-Up Center is an officially licensed toy and playtime accessory modelled after the animated Disney Junior series. Doc tends to the ailments of her toy friends, while also dishing out excellent advice and life lessons for your young ones. With more than two dozen pieces, and lots of medical-minded accessories, this toy set is perfect for fans of the animated series. The Doc McStuffins Deluxe Get Better Check-Up Center comes with a recommendation for children three years of age and up on the packaging, but this may be just a little young. This complete toy medical center actually has a checkup table for your child's toys, and it would be a great companion piece for your child while he or she is watching Doc McStuffins on television. The Doc's pal Lambie has been included so your would-be Doctor has a willing patient right out-of-the-box. When Lambie is placed upon the checkup table, lights and sounds are activated, and your child can use the accompanying electronic Big Book of Boo Boos to decide on what treatment is needed. This kit also comes with a pretend cell phone, and the built-in leaf on the operating table slides up and down to measure the height of the patient. A portable scale is included to check a patient's weight, and Band-Aid like stickers can be removed from the storage area on the door of the unit. The deluxe Toys R Us edition adds 14 bonus pieces not found on the standard checkup center, including a child sized lab coat and mobile first aid kit full of accessories. The Doc McStuffins Deluxe Get Better Check-Up Center will be more than familiar to your child if he or she is a fan of Disney Junior. The mobile first aid kit and children's lab coat are the highlights of the bonus package in this deluxe kit, one that will provide hours of play along enjoyment for your little future Doctor who is a fan of the show. __The Disney Doc McStuffins Time For Your Check Up Doll is sure to be a hit with your child this Christmas. This doll looks just like the character on the popular show for kids. And she can help to heal toys just like her television counterpart. This doll comes with several accessories including the character Lambie, a doctor bag, a comb, and three medical tools. Doc McStuffins will be able to take Lambie's temperature, listen for her heartbeat, and take her temperature. When she uses her medical tools, Lambie will talk in response, which mimics the actions that happen in the actual show. Your child will love to hear the interaction between Lambie and Doc McStuffins. The Disney Doc McStuffins Time For Your Check Up Doll is a talking doll. She also sings the popular song from the show "It's Time For Your Check Up". In addition, she is a great size for children of all ages. At fourteen inches tall, she is just the right height to play with easily. (Until now, most of the Doc McStuffins toys have been quite small, making play a little more difficult. Customers also rave about the interaction between the Doc and Lambie. You can play with each one separately and enhance the fun when you play with them together. Youíll also love how soft Lambie is. You can tell that this accessory wasn't an afterthought and is just as important as the Doc McStuffins doll. Together they're a perfect match of softness and opportunity for make believe. This doll's doctor bag and medical tools are sparkled with glitter, and girls love the glittery look of the tools. Every little girl will enjoy playing with this doll and you can feel good that she's a great role model for your daughter. Sheís a girl that's smart and uses her knowledge and skills to help her friends. She might even spark your daughter's interest in the medical profession. This combination of fun and education is a winning match for a toy. It's also a durable product that's meant to last a long time in the hands of your child. If your child loves the show, then this is the perfect toy for Christmas. 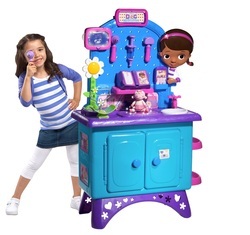 The Disney Doc McStuffins Time For Your Check Up Doll brings the magic of the television show home for the holidays.